What is a mirror bush plant? This unusual plant is a hardy, low-maintenance shrub that thrives in difficult conditions – especially salty coastal environs. The plant is named for its amazingly shiny, jewel-like leaves. It’s easy to understand why mirror bush plant is also known as looking glass plant and creeping mirror plant, among other “shiny” names. 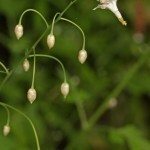 Want more mirror plant information? Keep reading! Mirror plant (Coprosma repens) is an evergreen shrub suitable for growing in USDA plant hardiness zones 8 through 11. This fast-growing shrub can reach mature heights of 10 feet fairly quickly. 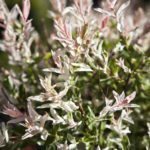 Mirror bush plant is available in several variegated forms and various combinations of creamy white, lime green, bright pink, purple, gold or soft yellow. The colors intensify when cooler weather arrives in autumn. Dwarf varieties, which top out at 2 to 3 feet, are also available. Look for clusters of inconspicuous white or greenish-white blooms followed in summer or fall by fleshy fruit that turns from shiny green to bright red or orange. Growing mirror plants isn’t difficult, but the plant requires moist, well-drained soil with a neutral or slightly acidic pH. Mirror plant tolerates partial shade but prefers full sunlight. Mirror plant care is easy too. Water mirror plant regularly after planting. Once the plant is established, occasional watering is usually sufficient, although mirror plant benefits from water during hot, dry conditions, but be careful not to overwater. Although mirror plant likes moist soil, the roots are likely to rot if the soil remains muddy or soggy. Provide a regular, balanced fertilizer before new growth emerges in spring. A neglected mirror plant can become scraggly, but twice-yearly pruning keeps it looking its best. Just trim the tree to any desired size and shape; this sturdy plant tolerates heavy pruning. Read more articles about Mirror Plant.